For a lion, learning to hunt is one of the most important skills that it will ever acquire. In the early days hunting is a combination of instinct, observation, and practice for young lions. 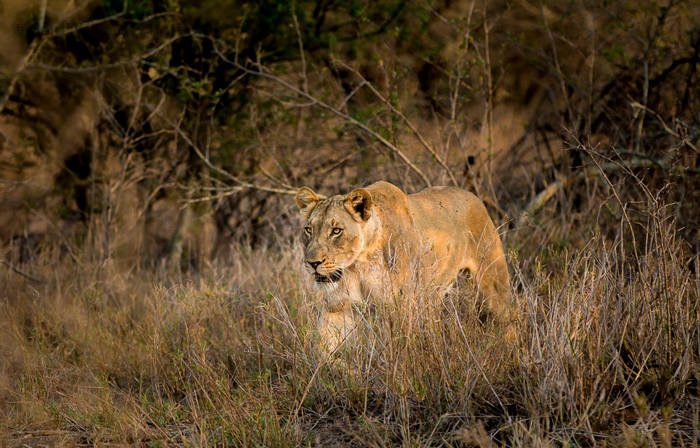 Wildlife photographer Heidi Watson was on a game drive at Rhino River Lodge when guests were privileged to witness a hunting lesson with a lioness and her two sub-adult cubs. She shared her photos and story with us. Early one morning the Rhino River Lodge game drive happened upon one of the Zululand Rhino Reserve’s resident lionesses and her sub-adult male and female cubs. The guests watched as the lions began their morning by rubbing against each other, licking one another, and playing a bit together. 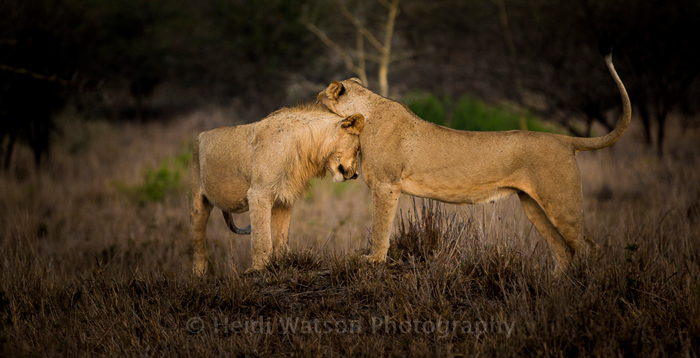 These social behaviours are important in helping lions reinforce the bonds that are so important to their survival. Suddenly the lioness became very focused on something in the distance. 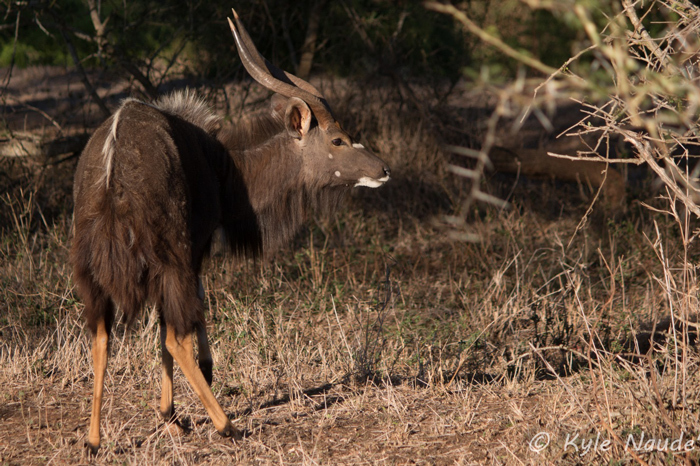 As we looked to see what had caught her attention, we noticed two mature nyala bulls browsing, completely unaware of the lion’s presence. As the lioness, with her cubs close behind, approached the nyala, they caught wind of her and fled. The mother, a little despondent, immediately turned her attention to a large warthog. The old adage, ‘if at first you don’t succeed, try, try again’, certainly rings true in the lives of predators, especially when a young animal is learning the skills involved in successfully taking down prey. With the warthog in sight, the female cub took the lead and began to stalk her chosen prey. 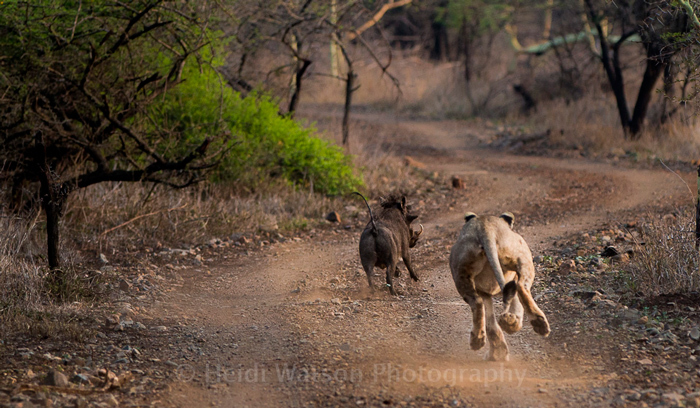 The warthog had now turned to face the road and the moment he did so, the lion sprang into action and began the chase. The warthog tried to evade the lioness by ducking under a fallen tree, which forced the young lioness to jump over it while still in pursuit. 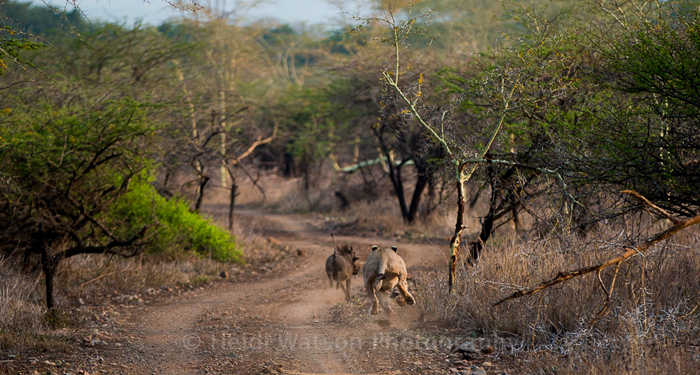 The warthog certainly didn’t waste any time, and at full speed ran down the dirt road leaving the young lioness in his dust. 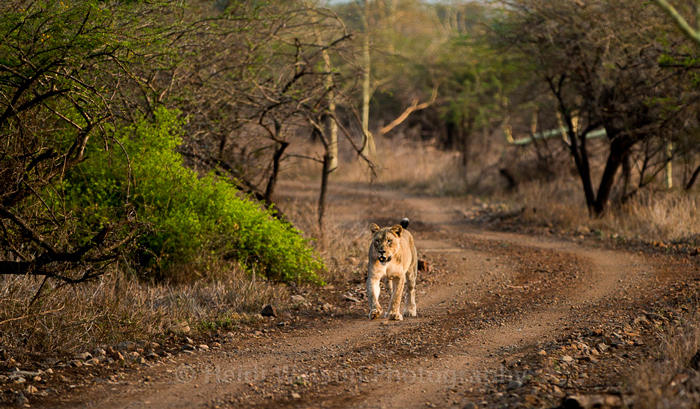 At the end of an unsuccessful chase, the young female turned around and trotted back to her family. Though she appeared quite pleased with herself, her mother and brother seemed decidedly less impressed. As a last-ditch effort the young female began chasing a group of nyala bulls, but with no clear strategy involved, she charged after the antelope with yet another disappointing result and for the third time had to go back empty-handed to her awaiting brother and mother. Not every sighting on a safari ends in a spectacular fashion and not every hunt by a predator ends in a kill. For the tourist, sometimes watching the story unfold is its own reward. For the predator, sometimes having a pride that supports you is the most important thing. They say practice makes perfect, and we heard that later in the day this small pride did indeed make a successful kill.